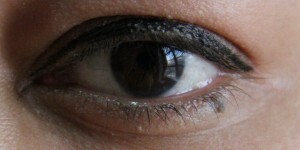 The other day I was going through a list of best drugstore eyeliners, and I saw the Maybelline Master Precise Eyeliner. I thought I’d give it a try. So I went to my nearest drugstore and bought this eyeliner. The eyeliner, I must say, works really well. When applied it dries really fast and doesn’t smudge to the upper part of the eye if you blink your eyes. The color is black. Absolute felt tip. It doesn’t drip and doesn’t dry (unless you leave it without the cap on for too long). It glides on smoothly and doesn’t make your eyes itchy. Master Precise eyeliner’s exclusive ultra-thin 0.4mm brush-tip provides continuous flow for smooth even lines. It is ophthalmologically tested and is safe for contact lenses. You can line it along the upper lash line and you can glide it outwards for a winged eyeliner or if you want to create a more dramatic and distinctive look. You can apply it and the smudge it with a smudger brush with some black eye-shadow on it for a smokey look. You can buy the Smashbox Double Ended Smudger Brush here. You can buy the Maybelline Expert Wear Eyeshadow Singles, Night Sky 240s Stylish Smokes, 0.09 Ounce here. I absolutely adore the immensely strong black. Whenever I’m in a rush I use this pen. But this eyeliner is not water-proof so be careful if you are washing your face, but it doesn’t smudge the moment you sprinkle some water on your eyes. Compared to some of the other felt tip liners that I’ve used, I’d rate this one as one of the best ones I’ve used so far. Doesn’t make your eyes feel itchy.